Shutterepairs has now all range of tubular motors available for roller shutters and all kind of garage doors in London area . We carry in our vans all types and sizes of motors, adaptors that we can give our customers quick and good service without wasting their time and money. We offer the best prizes and top quality parts . 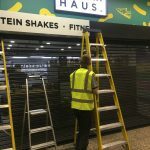 We supply and fit on site all types of parts for security roller shutters in London .